One of my favourite quick and easy meals is a spicy tofu salad. I hesitate to call this or most of the things I make a ‘recipe’ because it usually consists of me throwing a lot of a things in a pan/bowl/receptacle and hoping it turns out well. Take one packge of extra firm tofu and cut it up into 1 inch strips about a half-inch in width. In London I just use Cauldron. It’s cheap and you can pretty much find it anywhere. 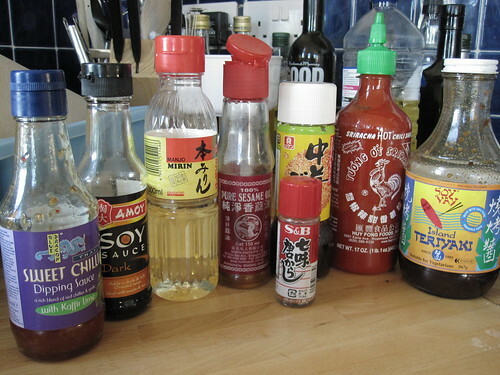 Make a mixture out of a generous squirt of sriracha, about one tablespoon of mirin, about three tablespoons of ponzu and a little bit of soy sauce. If you have it handy, you can add ginger or finely minced spring onions. Toss the tofu in the mixture. If you have time, marinate it for a couple hours. If not, it won’t kill the salad or flavour if the tofu is only soaked for a few minutes. 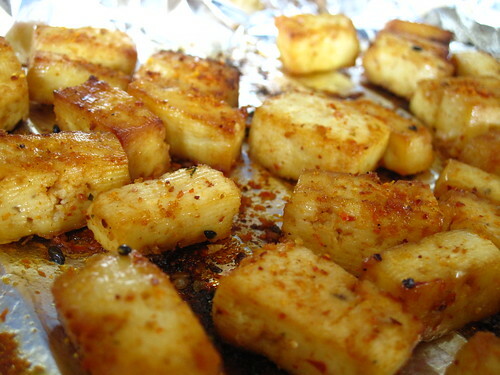 Lay out the tofu on tin foil and shake a generous amount of togarashi on top. Sprinkle with sesame oil. Bake at about 175C for about 15 minutes. Turn over, cover new side with togarashi and sprinkle sesame oil. Bake for another 10. Mix them all up, turn up the oven to 200 and bake for an additional 5. They should be golden and crispy, but not dry on the inside. 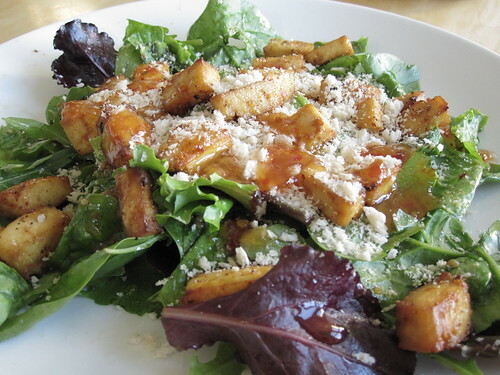 In the meantime, clean and tear up some mixed leaves or spinach and toss lightly in the Soy Vay Island Teriyaki sauce. Technically you should be able to use any light teriyaki sauce or dressing, but I really prefer Soy Vay. It’s fabulous and versatile. You can find it at Whole foods for about £4.89. Seriously, go buy it now. When the tofu is done, toss the pieces in with the greens, top with panko, and pour a few drops of sweet chili sauce on top. ummm…looks great. this salad and a bottle or two of beer would be a fantastic meal. perhaps maximator or wolnzacher märzen? or asahi super dry? Yum! I could have something nice and sharp with it, definitely. P.S. It’s 5 am where you are – why are you up reading my blog? Go to sleep! This recipe looks absolutely delicious! I’ve been trying to find Soy Vay in London to no avail, where were you able to track down yours? Thanks so much in advance.